Many Maryland farms offer pick-your-own opportunities allowing costumers to enjoy fresh local produce including apples, pumpkins, berries, peaches, vegetables and more. 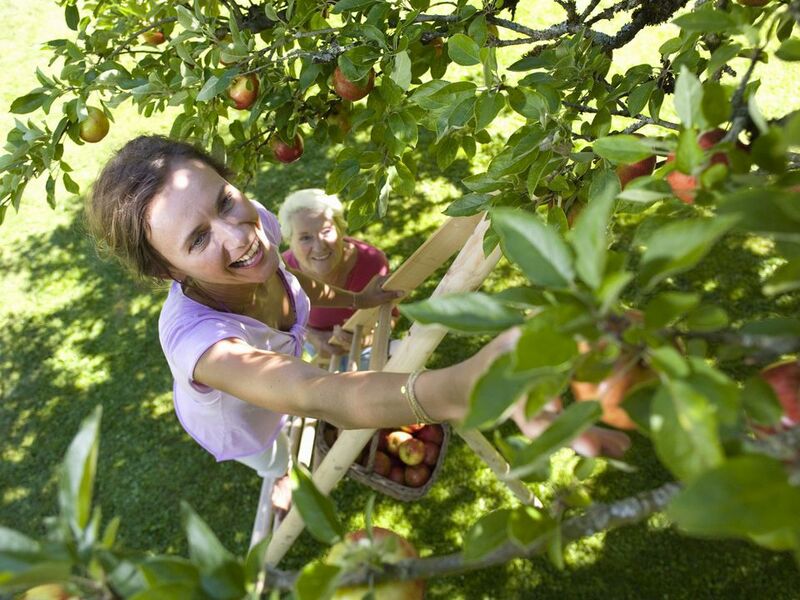 A trip to get healthy foods directly from an orchard or roadside market makes for a great family outing. Here is a guide to the orchards in the Maryland suburbs of Washington, DC. Many of these farms host seasonal activities for children including special events with hayrides. Fruits and vegetables are seasonal and subject to weather conditions, so be sure to call the farm ahead to make sure that the item you wish to pick is available. Blueberry Gardens - 233 and 237 Ashton Rd. (Rt.108) Ashton, MD (240) 324-6110. Pick-Your-Own Blueberries. June-August. Butler's Orchard - 22200 Davis Mill Road, Germantown, MD (301) 972-3299. Open mid May-December. Pick-Your-Own: Apples, Berries, Peas, Potatoes, Flowers, Pumpkins and Christmas Trees. Catoctin Mountain Orchard - 15308 Kelbaugh Road, Thurmont, MD (301) 271-2737. Open May-December. Pick-Your-Own: Apples, Peaches, Cherries, Plums, Pears, Berries, and Grapes. Educational Orchard Tours. Chase Produce - 2857 Davidsonville Rd, Davidsonville, MD (410) 798-1580. Pick your own strawberries. Gorman Farm - 10150 Gorman Rd., Laurel, MD. Pick-Your-Own Strawberries. Homestead Farm - 15600 Sugarland Road, Poolesville, MD (301) 977-3761. Open June – December. Pick-Your-Own: Apples, Peaches, Berries, Tomatoes. Larrliand Farms - 2415 Woodbine Road, Woodbine, MD (301) 854-6110. Open late May-early November. Pick-Your-Own: Apples, Strawberries, Blueberries, Raspberries, Blackberries, Tart Cherries, Peaches, Plums, Spinach, Beets, Broccoli, Tomatoes, & Pumpkins. Lewis Orchards - 18901 Peach Tree Road Dickerson, MD (301) 349-4101. Pick-your-own apples, along with the existing cut-your-own zinnias. Middleton's Cedar Hill Farm - 5190 Leonardtown Road, Waldorf, MD (301) 399-9812. Flowers, pumpkins, winter squash, other vegetables, Turkeys (organic, not-hormone-fed), and prepicked produce, snacks and refreshment stand, picnic area, farm animals. Pryors Orchard - 13841B Pryor Road, Thurmont, MD (301) 271-2693. Open mid June – mid November. Pick-Your-Own: Apples, Peaches, Pears, Cherries, Nectarines & Blueberries. Rock Hill Orchard - 28600 Ridge Road, Mount Airy, MD (301) 831-7427. Open May- mid November. Pick Your Own: Apples, Sour Cherries, Vegetables, Herbs & Pumpkins. Sycamore Spring Farm - 6003 Elmer Derr Rd., Frederick, MD (301)788-6980. Pick-Your-Own: Berries, Cherries, Cherry Tomatoes, Figs, Grapes, Flowers, Herbs, and seasonal surplus items. Must be a member of the Community Supported Agriculture (CSA) Program.